you’ll have the same pampering photo shoot experience (which, believe us when we say, is actually what it’s all about). all of our clients the same chance to feel like a glamour model! Professional hair and make-up, including lashes. The makeup artist stays throughout the shoot for touch-ups and corrections, and to help with styling. A pre-shoot consultation with Lori (either via phone or email) to help plan your shoot, discuss wardrobe, etc. If you prefer to meet at the studio for your consultation, that can be arranged. Your photo shoot with Lori, who will guide you through posing and expression. The number of sets/outfits varies per package, but every set includes a wide variety of poses. Your image reveal session with Lori where you’ll choose your images and products and discuss your retouching desires. Magazine-quality retouching, done by Lori, on all images you select for your final products. The ultimate in elegance and style. A stunning choice for a special milestone celebration of your love. 3 sets/outfits with makeup and hair changes as appropriate. 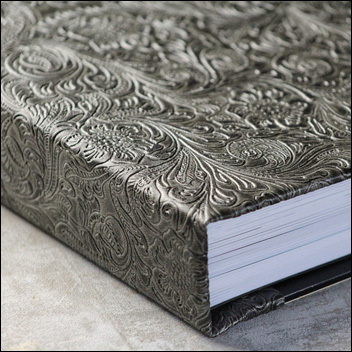 A stunning, custom designed 8×10 bound album, with your choice of a wide selection of cover materials including exquisite leathers, Japanese silks, suedes and brocades. Lay-flat, thick pages. Presented to you in a black velvet and lace wrap, and a black satin pouch. Includes a bonus 8×12 matted print of your favorite image. A crystal thumb drive containing high res digital files of your 25 chosen images. a fine art feel and presentation. Elegant and discreet keepsake boxes holding matted archival prints. Prints can be kept in the box, or pulled out and framed at any time. An 8×10 folio box holding 20 matted 5×7 prints: $1100. An 11×14 folio box holding 20 matted 7×10 prints: $1350. A crystal thumb drive containing high res digital files of your chosen images. 2 sets/outfits with makeup and hair changes as appropriate. A gorgeous, 6×8 custom-designed, flush-mounted, lay-flat book. Comes in a very romantic, black organza tie-top pouch. A crystal thumb drive containing high res digital files of your 15 chosen images. or a tiny treat for someone special. 1 set/outfit with one makeup and hair look. A beautiful and archival 8×10 image folio containing 2 matted 5×7 images. A crystal thumb drive containing high res digital files of your 2 chosen images. All of our album and folio packages include high-resolution digital files of your chosen images. we offer a digital option that includes fully retouched high res images. Delivered via download. Especially great for model portfolios and website needs. 10 retouched high res (up to 8×10) digital images delivered via download. If you’re a previous client coming back for your second (or third!) shoot with us, take 10% off your total purchase price. If you’re a new or returning client and allow us to use some of your images on our website, take 5% off your total purchase price. Have any questions? Contact us here. I promise we don't bite!